What is needed is installing an 8-pin LEMO socket on the host panel, power is supplied to the module via a cable, the measurement data will be read from the module, thus assembly of the module and the host is completed. Detailed communication protocol will be provided together with the sidestream ETCO2 module, monitors manufacturers simply complete the corresponding the display according to the provided communication protocol, everything will become so easy. Even more pleasing is, the communication protocol of our CO2 module is compatible with the Sidestream LoFlo CO2 module by Respironics, which means existing Respironics sidestream CO2 module users do not need to change even a program code, simply plug in our CO2 module and it will work perfectly and you are making the switch seamlessly. The Low-flow design (low sampling rate) better matches the performance of the water line, and gets rid of the trouble of installing the water trap and its bracket on the monitor; it also reduces environmental pollution caused by exhaust gases, and is good to monitoring newborns with less exhaled gas and other occasions. With the continuous progress achieved in medical industry, doctors and patients both have become increasingly demanding on configuration parameters provided by the monitors, end-tidal CO2, which is on high-end side, is gradually becoming a standard parameter for patient monitors. So, the problem facing now, is how will the monitor manufacturers deal with the ever-intensifying competition? How to maintain reasonable profit margin while the prices are coming down more and more? Our LowFlow sidestream ETCO2 module Model C300 will be your best choice to make high-end parameters monitors with low-end cost. We will satisfy your needs with our long expected ETCO2 module Model C300! Contact us now to get the world's most cost-effective CO2 module and become the leader in the world monitors market. 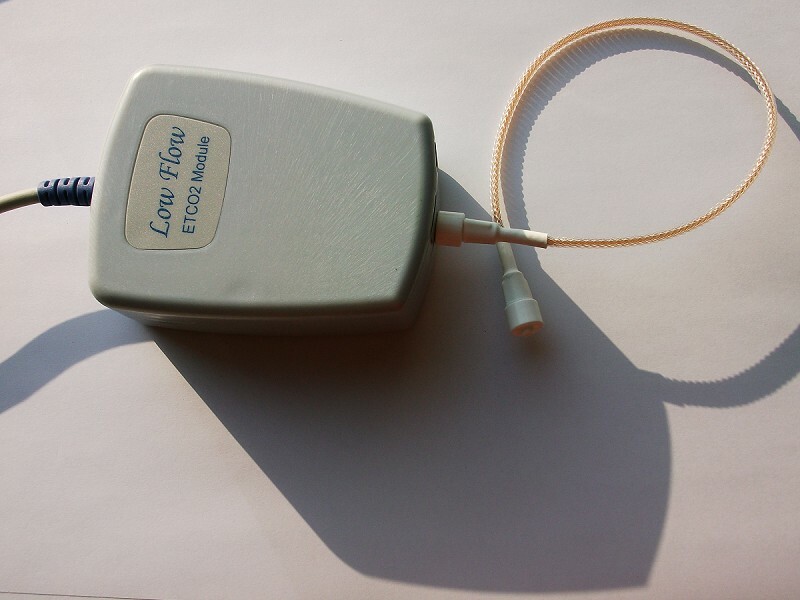 Below is a list of monitor brands, some of their models use the plug & play CO2 module of Respironics Loflo, for those monitors, you can use our ETCO2 module C300 directly without any problem, you don't even have to change anything on the software. Except for replacing the sidestream module of Respironics, our Module C300 will also be able to replace the mainstream module of resprionics except that our module will still in a sidestream way. If you want to order the CO2 modules for monitors of any of the following brands, while placing an order, please let us know the brand and model of your monitors so we can make the specific CO2 module with the exact connector and firmware! GE Medical Systems Information Technology U.S.A. Drift over any hours shall not exceed 0.5 mm Hg max. Rated input: Less than 0.5 Watts typical. Steady State Less than 1.1 Watts maximum on Offset Calibration or sampling line occluded. RS232, bi-directional, 19200 baud. Standard N-8-1. CO2 gas concentration (mm Hg), End-tidal CO2, Inspired CO2, Respiratory Rate Gas and barometric pressure. and essential performance of respiratory gas monitors. 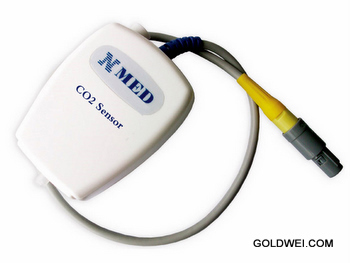 ETCO2 module (end-tidal CO2 module), is the expandable module used in Patient Monitor and is used to monitor the breath status by measuring CO2. It is useful in the ICU, surgery, anesthesia ward, emergency clinic, etc. The ETCO2 module is a complete data collection and analysis system for monitoring respiratory carbon dioxide concentration. The Model C300 module includes a miniature CO2 sensor, barometric pressure transducer, sampling flow control and a miniature low-power vacuum pump. A microprocessor collects the sensor data and calculates various real-time parameters: instantaneous CO2 concentration, respiration rate, end-tidal CO2, inspired CO2, inspiration and expiration times.